Once you figure out the part positioning. Its easy to use and maintain. Far better than FDM but parts can be brittle if not cured properly. PS. Thanks for all the work you do! Hey Sunnyc90, first welcome to the site :-) and thanks for the great info. I'm been doing some reading and watching reviews already and from what I understand the D7 doesn't like the maker juice G+. It seems it has something to do with the bed not moving much and after a while the pigment settles in the bath. 'Fun to do' resin seems to be okay but I'm not sure if this is just the clear. If so, then the G+ might be the same where clear is okay. It's defo costs more but I'm wondering how much FDM filament do I actually waste ? At the moment quite a lot. The brittleness does concern me a little, would you recommend getting a UV light.. also is it uvA / B or C ? I need to do some more reading! Thank you! I have been hanging around watching builds and in the process to start building my own soon. Here is a site to give you better information with Fun to Do resins (http://www.buildyourownsla.com/forum/viewtopic.php?f=19&t=2630). I am a bit surprised that the maker juice wont work with D7 since since its not a laser type printer. It's based from a Projector style Printer but rather than a bulb it uses a UV LED to cure the resin and yes I definitely recommend getting UV lamps to speed up the curing process and it will evenly cure the part unlike just leaving it out by the window. UVA is the most commonly used source. Steve where did you get a sla for 500. I have been wanting one but they are always super expensive. Email Gary and ask him for a price including shipping to your address. He accepts paypal so it's really easy to pay. From what I understand the D7 has just been released so not all stockists have information on it. I thought it was best to get it from Wanhao themselves. 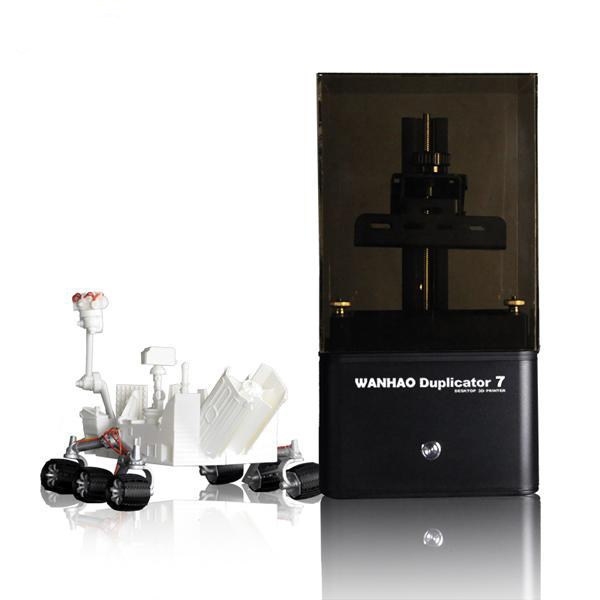 His email address is - gary@wanhao3dprinter.com he's the general manager there. Tell him you saw the D7 on DIYRC and he might even give you a little discount ;-) can't promise anything but worth asking. There are a few reviews up on YouTube which I've been watching but like you say.. they are normally £2k plus. Let me know if you take the plunge. Ordered a UV lamp from Amazon UK. http://amzn.eu/6PLa0V4 I've also ordered a clip on lamp holder.. going to look at making a curing box.. maybe with a timer on it. That's very tempting I was close to hitting the buy now but put off by the print volume. It will be interesting to see what other companies release now Wanhao have broke the £500 price barrier. Busted44, Yeah the volume isn't great but for small components like the gimbal I think it's made for it. :-) You do have a 200mm height limit so I'm guessing things could be rotated more that way. If you do this then you get a 120 x 200 x 68.. which isn't bad. I would have to play a bit to see whats possible. .. Mavic base would fit if you stood it up. You're governed by the size of the LCD screen I think with it at the moment. Kondratev, ordered 2...wow, thats a brave decision knowing its only just been released. I was watching some the youtube videos last night of the pre-release models and looked into using a raspberry pi so it can be used untethered from a computer. I am so tempted but resisting (maybe) as I know this will only open the flood gates and expect more models to be released soon. and this should help reduce the price of the resin as well. Steve/Kondratev, do you have a delivery date or will it be a case of expect it when ever it arrives? wow.. 2, I should be on commission! :-) No delivery date mentioned, I'll email him and ask. Regarding the PI, yes I've been doing some reading and I think it's going to be a great addition to be honest. My current PC has 3 screens and a projector attached so I don't have any free hdmi ports. I did a bit of reading and someones already come up with a solution but you need to reflash it with different firmware that talks back it seems. Will do some more reading tonight. Yea I figured why not. He said discount if I get more than one hahah could not resist. The second will be a nice present for my wife's brother. For shipping all he told me was that it was really fast. Not sure if it's gonna come from China warehouse or the u.s, one. He is gonna email me tomorrow on more info of purchase. As for the pi. Yes do it. Currently use 7 different pi,s for each of my projects. For example. Got one hooked up to current printer for octopi. Another one for media center. Third one as a door bell. Once some one rings door bell. It will take there picture and send me a text message of it. I have another as a NAS server to back up all of our phones laptops computer etc. one to search for alien life forms Ghana yes you read that right. Thanks for the kind offer but Ive got a pi3 somewhere i bought for a retropi project that needs finishing.. yet another project! oh and Ive got one running home automation thats never really worked so i might just use that one. I have another printer coming soon to do a full review on.. well two actually but cant say much more until its confirmed. Defo think the PI is the right way to go.. once configured do you just connect via a webpage do you know? upload the stl via that?